Legend says that at the end of 13th century a ship in the Malpe coast was caught in a storm and the captain of the ship prayed to the saint Madvacharya who was meditating at the coast. Madvacharya with his power controlled the course of the wind by waving his saffron vastra and calmed down the rough sea and guided the ship to safety. The thankful captain of the ship pleaded to the sage to ask for anything in his ship load. Madhwa being an ascetic accepted just a sack of dried sandal paste called as Gopichandan (a paste that is used by the devotees of Krishna to embalm them before the poojas). Inside the sack were two small idols covered in sandal paste which after cleaning revealed that the idols are of Krishna and Balarama. During the last phase of the 'dwabara yuga' Krishna's mother Devaki wanted to recall the younger days of Krishna and Rukmini wanted to see the pranks played by her husband during his child hood days. 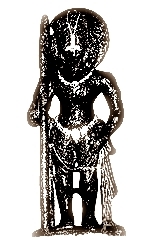 It is said that Krishna had ordered Viswakarma to make an idol of Krishna.This idol was originally made up of a large Shaligram stone and was said to have been kept at Rukminis house where she worshiped. Applying gopichandan paste daily, the shape of the idol was lost in the sandal paste. After several thousand years a merchant bought all the sandal blocks from that place without he realising that the Krishna idol was among the lot. It was with this lot that the ship was traveling and was caught in the storm and the idol reached the hands of SriMadwacharya. Madhwacharaya was thrilled at finding his favorite Krishna. Madvacharya then consecrated Krishna in the now Udupi and Balarama in Vadabandeshwara. The Krishna temple founded by Madhvacharya dates back to the 13th century AD. It is a modest structure enshrining the image of Balakrishna in a sanctum that has to viewed only through a grating referred to as the Navagraha kindi or Kanakan kindi ( kindi meaning, window), which has nine square holes. This gold plated window has 24 different images of Krishna. The alankara (decoration) of the SriKrishna is just divine. Featuring a golden kavacham with halo on some days and a diamond kavacham worth many lakhs of rupees on other days, SriKrishna is seen as the MahaVishnu himself in his Dasha­vatars, and as a beautiful goddess Lakshmi and Sarasvathy alankars on Fridays and during Dasara (Navaratri). Sage Madvacharya's shrine is situated right next to the sanctum. Behind this shrine is the eastern entrance of the sanctum, which will be opened only on Vijayadasami. Also in the temple are shrines to Garuda, Hanuman, Subramanya and Vaadiraaja. Adjacent to the main corridor there is the holy tank called Madvasarorava ( Madhava Pushkarani). The tank was originally known as Anantha Theertha, but after the Ganga descended into this tank for the sake of Madhvacharya, it came to be designated as Madhvasarovara. The tank has a mandapam in the centre and has stone steps all round. In the southwest corner of the tank is a shrine dedicated to Bhaagiirathi ( Ganga ) seated on a crocodile. It is believed that Ganga flows in to this tank once in 12 years. Water from this tank is used for daily abhishekams of Sri Krishna. The Udupi mutt offers the devotees porridge as breakfast, followed by a full course meals from 11:30 AM till 4 PM and 7:30 PM till 11 in the night every day of the year. It is believed that whoever eats at this sacred place are blessed by SriKrishna. We come to know that this annadhanam has been goin on for the last 800 years.The steaming hot rice served with sambar and rasam are out of this world prompting one to ask for more. The hospitality by the temple and mutt volunteers is overwhelming and they in fact insist every devotee to have food. No one should go out of the temple hungry. Darshans and timings The temple is open from 5 AM till 10 PM daily.The Sri Krishna idol is etched with the Vishnu’s Sudarshan Chakra. The beauty of this can be seen only dur­ing the Ksheera Abhisheka performed early in the morning. Vishwaroopa Darshana of the lord may be had at 5.15 am. Then there is the cradle and chamara (fan made of white horse hair) seva at 7 pm, when the lord is made to sleep with lullabies The presiding acharya gives prasada to all devotees after this seva. How to Reach? Udupi is well connected with other neighboring cities by Karnataka Road Transport Corporation buses. Regular bus services are available from Mangalore to Udupi. Where to stay? There are many good hotels in Udipi itself. You can have a wide choice of hotels in Mangalore also. Where to eat? The best place to have food is the matt itself. If you missed eating at the matt try some of the restaurants in Udupi. You get good variety of south Indian delicacies. Variety of Dosas and Vada are very famous here. Places nearby Anegudde the famous temple for Ganesha , Koteshwara and Shankarnarayana are famous local temples, all within a 30-km radius of Udupi. The weather The climate of Udupi is generally hot in summers and pleasant in winters. The maximum temperature touches 40°C in summers (March to May) with a minimum of 18°C. Winters (December to February) have extreme weather of 32°C (maximum) and 14°C (minimum). June to September are the period of monsoon, accompanied by heavy winds in southwest and northeast directions. Best season to visit here is from October to March.